Tim Gunn gives raves to The Royal Wedding Gown. Click here for more. Tim will be back in NYC to cover Royal Wedding Fashion on Friday for ABC, then he heads to Salt Lake City on Saturday. It's hard to keep up! Click here for a more information and a fresh interview. Tim’s latest make it work moment • “I make something work everyday. I mean honestly, our fashion events are always about ‘make it work.’ Frequently a model doesn’t show up, or something happens to one of the looks, a zipper breaks for instance. We’re making it work all the time. 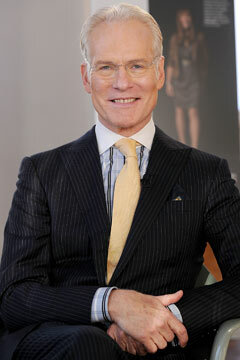 Don't miss Tim Gunn's "Makeovers" Tuesday night on NBC. Tim and Cynthia discuss royal fashion. CM: We talked to renowned fashion historian Judith Watt today, too, an old friend of yours. She’s fabulous. TG: I thought the same when I met her 10 years ago! CM: I couldn’t take my eyes off of her. CM: Viewers won’t get to see what was in her lap-- her little dog, Hettie sat there during our whole interview. TG: And I was careful not to reach for Hettie otherwise people at home would wonder what I was reaching for! 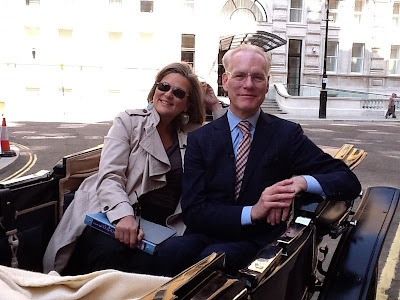 More from Tim Gunn in London! 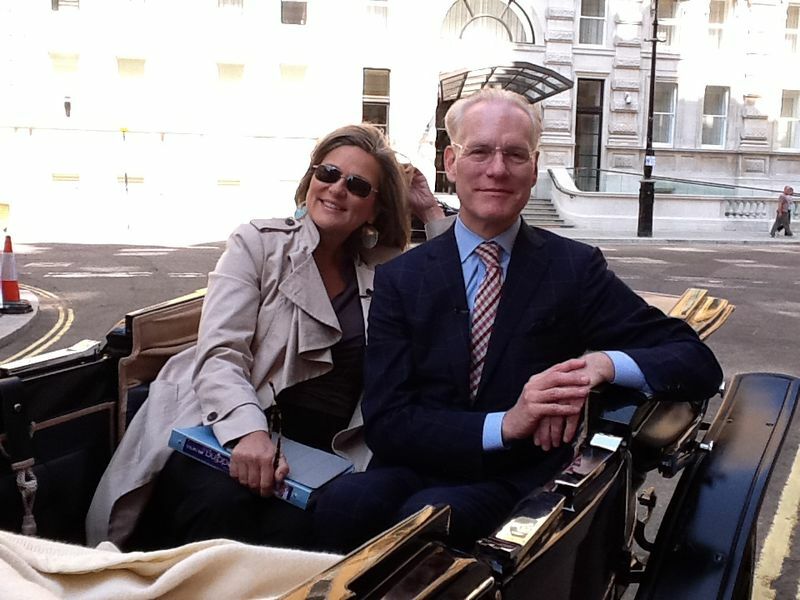 Nightline's Cynthia McFadden and Tim Gunn enjoy a carriage ride in London. Tim is in London to cover the Royal Wedding for Nightline. Click here for an account from the first day. CMF: What was your high point so far? TG: They were chocolate brown, Cynthia. With black hooves. CMF: Ahh! Right… so our chocolate brown horsed took us along the wedding route this morning before they closed the roads around Buckingham Palace --- it was just the thrill of a lifetime. Mondo Guerra, Christopher Collins, Michael Drummond and Casanova presented their latest collections at the Ala Moana Center on Saturday. Click here for a great report from Paula Rath. Mondo Guerra, Casanova and Michael Drummond join Andy South at Honolulu Community College April 21st. Click here for a new interview with Seth Aaron Henderson from vita.mn. Project Runway Season 8 designer, Casanova will be judging a fashion design benefit contest in Central Jersey on May 1st. Click here for more information. Click here to learn about plans to renovate Daniel Vosovic's Studio. Karl Lagerfeld directed three short films featuring Rachel Bilson to promote Magnum Ice Cream. The films premiered last night at the Tribeca Film Festival and Project Runway Season 4 champion, Christian Siriano was there. Click here, and here for more information. Project Runway Season 4 designer, Kevin Christiana has partnered with Andy Hilfiger to create this new line of Rock-inspired fashion. 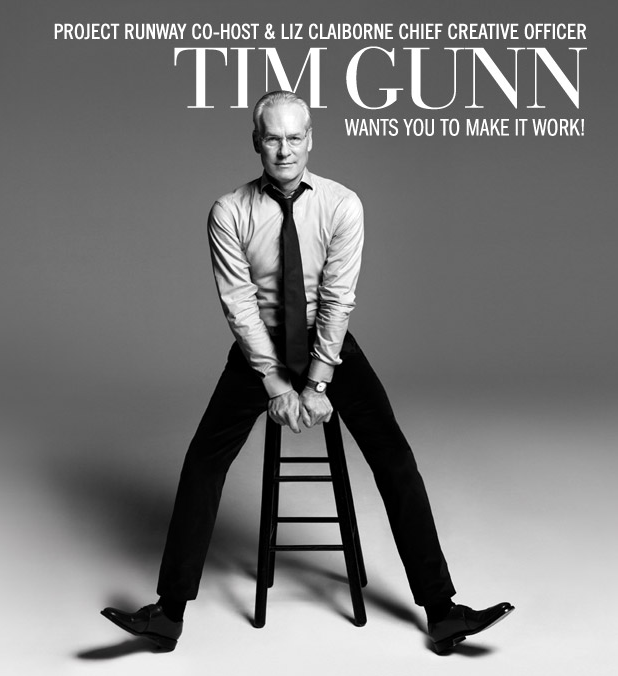 Click here to read more from Tim Gunn in Orange County. A highlight: On Jessica Simpson, one of the guest judges on Project Runway’s Season 8: “Jessica Simpson was there. I have no recollection of her at all,” he said. Attention Denver: Don't miss Mondo Guerra's latest collection at "Mucho Mondo" on May 19th. Click here for details. Mondo will also be at Macy's (Park Meadows) on April 30. Click here for details. Click here to shop the "private sale" at SeenOn. 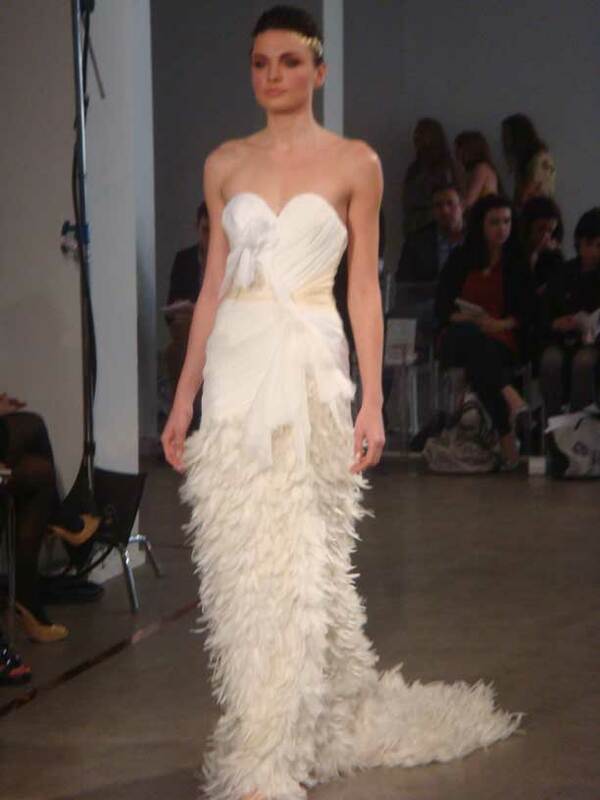 Project Runway Bridal Fashion on The Today Show this Morning! 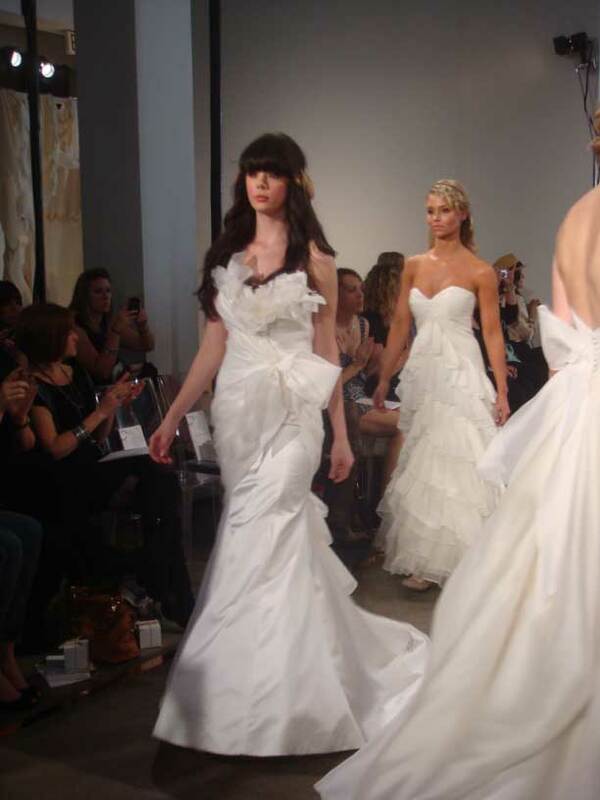 Project Runway designers have created wedding gowns inspired by the Royal Wedding. Tune in this morning for the bridal fashion show. Project Runway Season 8 designer, Michael Costello met up with Tim Gunn at the Orange County stop on Tim's Spring Tour. First, there were sketches, and now actual gowns from five Project Runway designers. Tune in during the 8:30 segment to see royal wedding dresses by “Runway” designers Emilio Sosa (Season 7), Johnathan Kayne (Season 3), Leanne Marshall (Season 5), Irina Shabayeva (Season 6) and Nick Verreos (Season 2). Project Runway Season 4 finalist, Rami Kashou continues his unique partnership with Papyrus creating another stunning gown! Heidi Klum in New PSA for "Stand Up To Cancer"
"The Revolution" will bow in January, replacing One Life To Live, as a daily show about health and lifestyle transformations from producer JD Roth and 3 Ball Productions (The Biggest Loser). A team of experts led by fashion expert Tim Gunn, and including celebrity trainer Hayley Pasternak and former American Idol Kimberly Locke, will showcases one woman's five-month weight loss journey over the course of five episodes. 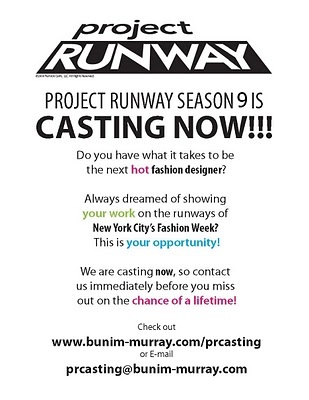 Be sure to follow ProjectRunwayS9 on Twitter. 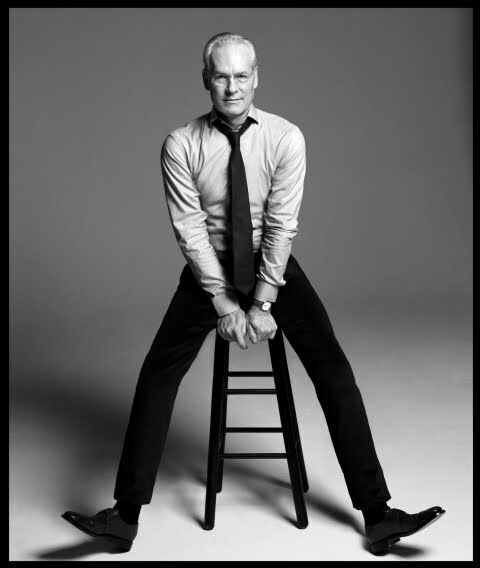 Tim Gunn makes another stop on his Spring Tour this weekend. Thank you Tropical Chrome for this fabulous report! Very few folks from Project Runway include Colorado in their travel plans. 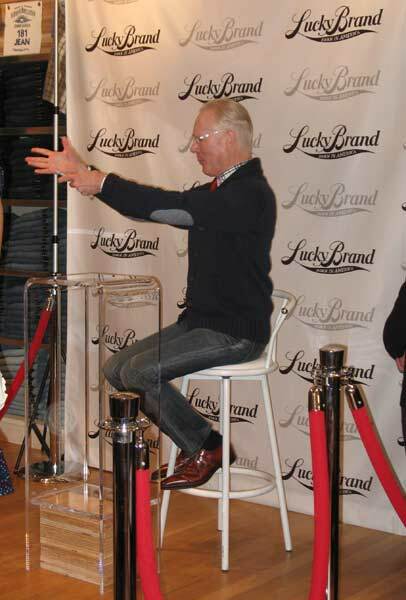 So when I saw that Tim Gunn's latest tour was scheduled at the Lucky Brand store at the Park Meadows mall, I knew I'd have to be there. I wasn't going to miss out on my best chance to date to meet Tim himself! 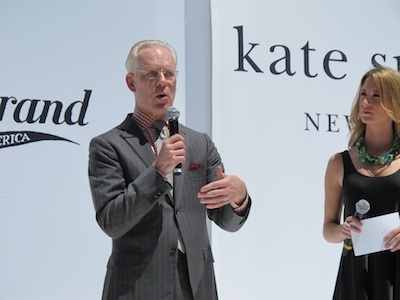 I'd planned to cover it for BPR, but Laura K went one better – she was able to work with Leah Salak, Director of Marketing and Special Events for Liz Claiborne, Inc. to arrange a 10 minute interview before the event with Tim. Given the space limitations of the store, we had to do this standing up in their storage room....so I really did have 10 Minutes In The Back Room With Tim Gunn! Tim himself is gracious, charming, and genuine – exactly what we see on TV. I recorded the interview on my new iphone, calling it "my new toy", and he said "Mine too, I'm not even using 5% of its capacity." It's nice to know I'm not alone! To start the interview, I asked Tim what he thought the biggest challenges were for Project Runway to keep the show new and fresh as it went into its ninth season. Tim replied that that WAS the challenge – keeping it new and fresh. He wished that more of the people involved with Project Runway would take an interest in listening to him – he has offered a number of ideas to the producers and not heard anything back. He's very proud of the show and wants to keep it robust and vital. 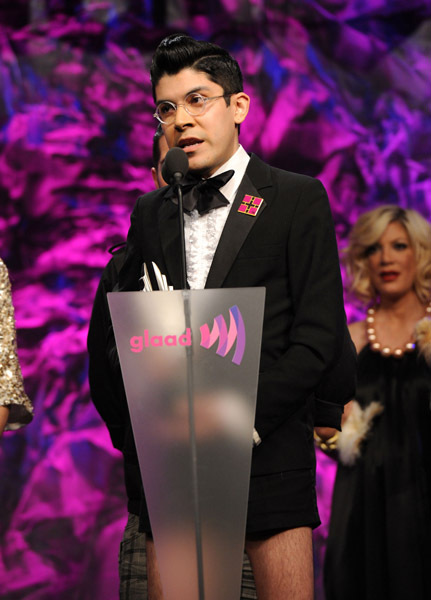 Mondo Guerra accepted the award on behalf of the producers. Season 8 designer, Michael Costello also attended the event on April 10 in Los Angeles, California. 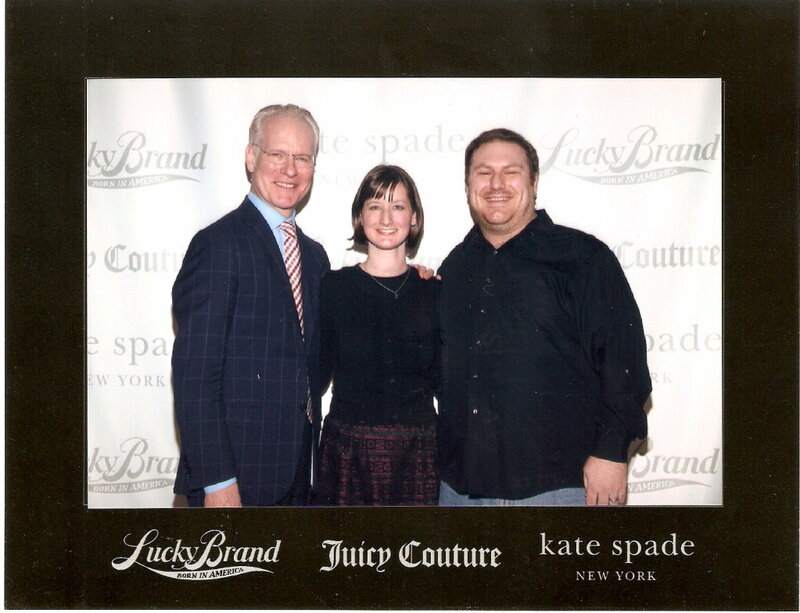 No sign of Tim Gunn! BPR Field Reporter Kenda Nunez attended the launch of Carol Hannah's Bridal Collection and sends us this report - thank you Kenda! The chic Chelsea Art museum which is surrounded by abundant natural light in New York City served as the location where Project Runway Season 6 finalist, Carol Hannah Whitfield launched her Spring/ Summer 2012 Bridal Collection. The event took place on Saturday, April 9th and it was attended by leading members of the wedding industry. The place was packed with photographers and magazine writers as well as Carol Hannah's supporters. Guests were welcomed with a dossier of all the designs that were about to walk down the runway. Hannah started the event with beautiful bridesmaid's dresses that were airy and colorful, made with silk organza, silk chiffon and silk charmeuse chiffon. The main event started right after with one dreamy dress after the other. The designs were delicate and refined and the variety was vast, there were A-lines, mermaid and ballgowns among others. Her necklines were dominated by asymmetrical, sweetheart and pleated designs. The headpieces, a collaboration with Cheryl King Couture were beautiful feathers on loose braided hair; gold pieces were also spotted on the runway. Overall the feel of this show was that of an ethereal/ bohemian bride, who is sweet, beautiful and not bound by traditional rules. We hope to see more from Carol Hannah and her amazing designs in the future. Click here for more photos of Carol Hannah's designs. In Part 2, Nick plays a little game of "Fashion Team" where he comments on recent looks from Eva Longoria, Selena Gomez, Kim Kardashian, Renee Zellweger and Carrie Underwood. Who do you think gets the label of "Armenian Milkmaid"? What a fun day - thanks to the great team at Macy's in Novi and thank you Uncle Nick! Project Runway Season 9 Casting Now! Application deadline is April 15th. Click here for details. Good luck designers! 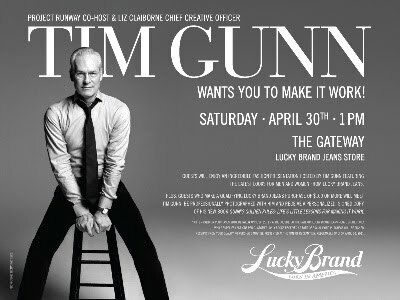 Tim Gunn will visit the Lucky Brand Jeans Retail Shop in Park Meadows at 11 a.m. Saturday for the launch of the spring Lucky collection. Those who have made a purchase of $100 or more from Lucky Brand Jeans can meet Gunn, have their photograph taken and receive a signed copy of his book, "Gunn's Golden Rules: Life's Little Lessons for Making It Work." 8401 Park Meadows Center Drive, Lone Tree. 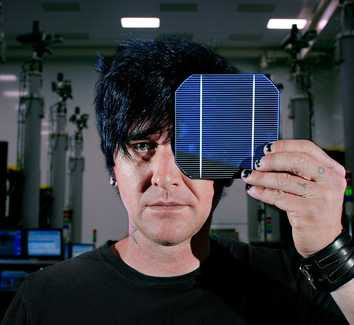 Click here for a new interview with Tim from denverpost.com. Project Runway Season 2 designer, Nick Verreos and his partner, David Paul designed this turquoise dress for their Spring 2011 Nikolaki collection. Project Runway season 7 champion, Seth Aaron Henderson presented his Fall 2011 RTW Collection at Project Ethos in Los Angeles on March 12th. 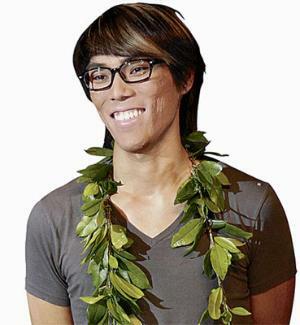 Casanova, Mondo Guerra and Michael Drummond will join Andy South at Honolulu Community College’s student fashion show, “TRANSITOPIA,” at 7 p.m. April 23. Nick Verreos was in Chicago last weekend for the "Putting It All Together" fashion event at Macy's on State Street. Nick hosted a fashion show and also invited audience members to style the models for various events. Nick will be in Novi, Michigan on Saturday. Click here for details. Kara's episode of "All on the Line" premiered last night on The Sundance Channel. Project Runway was such a huge learning curve for me. It is such a process, and so much of the growth comes from having such strong sounding boards and being in an environment that breeds creativity. I couldn’t believe how much I grew as a designer and a person. Consistency is also her personal success secret. "Keeping it all together as a modern woman means multitasking, especially when you work," she says. "I think you always need to try your best, but at the same time you can only do what you can do, and you don't need to beat yourself up about it. I'm not white-picket-fence perfect." 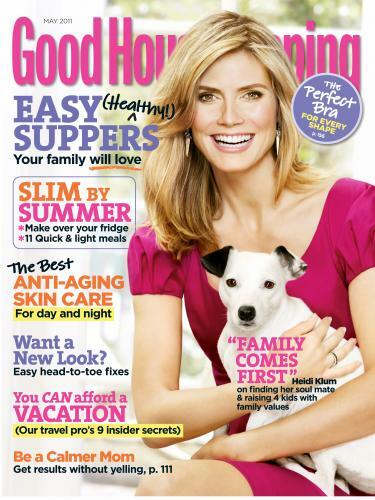 The issue hits the newsstands on April 16th. Labels: Heidi Klum, Is there anything she can't do? Project Runway Season 8 designer Michael Costello graciously agreed to an interview. He has been very busy! Photo courtesy of Daniel James Ryan Photography. Highlights: Regular readers know that Michael recently showed his Fall 2011 Collection at El Paseo Fashion Week. Click here for a gallery of all of the looks. Michael will be at "Reality Rocks" in Los Angeles April 9 - 10. 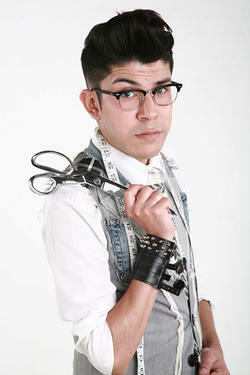 Project Runway Season 6 designer, Logan Neitzel was recently featured in modaCYCLE's "Designer Dossier." 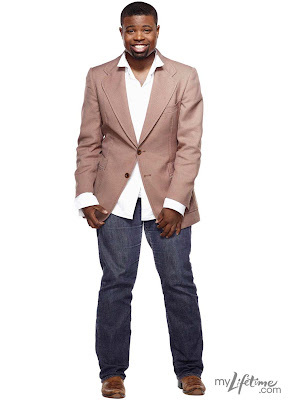 Logan designed the fashions and also styled the photo shoot. 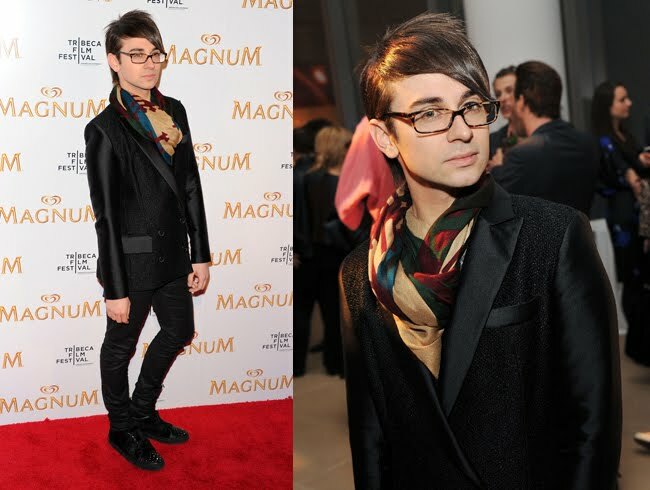 WHAS11’s Sherlene Shanklin caught up with Christian Siriano. The previously "Untitled Fashion Project" is now titled "Fashion Star" produced by Ben Silverman. A competitive-reality show for fashion designers? Check. Produced by Magical Elves? Check. What makes it different from Project Runway? Mr. Silverman said that retail buyers would be involved in selecting the winning designs. The show will include a twist. Each week viewers will be able to go online and buy the designs created by the contestants, even the losing ones. NBC will get a share of those sales, a point Mr. Telegdy underscored. “Any shows that can create auxiliary revenue streams, we are always keen to examine those,” he said. Also: The winner will receive a multimillion-dollar contract to have a new fashion line featured in top retail stores. Just to clarify - this is NOT an April Fool. The 10-episode show will premiere in 2012 on NBC. More information here, and here. Heidi Klum arrives at Nickelodeon's 24th Annual Kids' Choice Awards at Galen Center on April 2, 2011 in Los Angeles, California. Jennie McCulloch from Vivifie sends us a report from Tim's stop in Pittsburgh last weekend. She says that "there were a ton of people there – every seat was filled and a bunch of people were standing around, which annoyed the security guard near us, but it was cool to see so many people come out to see Tim. I’m glad we got a seat!" Q: Who was your favorite villain in Project Runway? Tim will be in Columbus tomorrow (Saturday!) Click here for info. Vogue: Wintour Out! Gunn In? Breaking News: Anna Wintour has reportedly left Vogue due to creative differences with publisher Conde Nast. 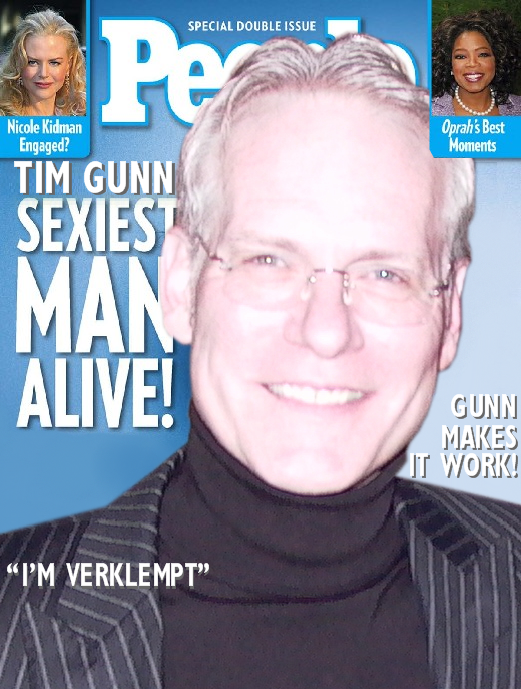 Sources say that Tim Gunn has been tapped as new Editor-In-Chief of the magazine. The creative difference apparently revolve around Wintour's affinity for featuring fur in the fashion editorials. When asked to comment, Gunn did not confirm or deny, but remarked that he would be "proud to follow in the footsteps of Diana Vreeland." Gunn also noted that because they share the same birthday (exactly 50 years apart) he has always considered Vreeland to be a "spiritual mentor." Click here for details as reported in WWD. LOS ANGELES, CA – Lifetime Television and The Weinstein Company are proud to announce the expansion of the award-winning Project Runway franchise with a brand new spin-off series, Project Runway Masters - Designing for Charity, debuting later this summer. The new series will pit some of the most exclusive names in the fashion industry against each other with new design challenges each week, competing for up to $250,000 of prize money for the charity of their choice courtesy of sponsor American Express. Sixteen world famous designers have been confirmed for this fashion face-off, including Alberta Ferretti, Carolina Herrera, Catherine Maladrino, Diane Von Furstenburg (! ), Donna Karan, John Galliano (!! ), Marc Jacobs, Michael Kors, Monique Lhullier, Ralph Lauren, Richard Tyler, Roberto Cavalli, Stella McCartney, Tommy Hilfiger, Vera Wang and Zac Posen. Project Runway Masters will be hosted by Marchesa co-founder Georgina Chapman and feature guest judges Andre Leon Talley and Karl Lagerfeld. Rachel Zoe, stylist to the stars, will have a recurring role as workroom mentor. "Each designer will employ an assistant who will handle all of the sewing details", says host Georgina Chapman. 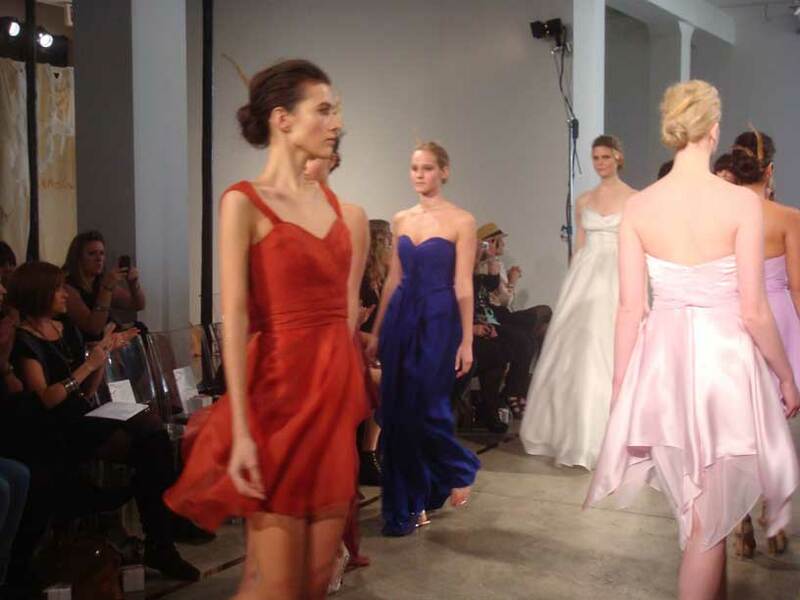 "Our designers will conceptualize each look, do model fittings and source the fabric." Guest judges for Season 1 will include Uma Thurman, Robert Downey, Jr., Cate Blanchett and Charlie Sheen. Workroom mentor Rachel Zoe will have her hands full with the diverse designers. "When I found out who was participating in this project, I literally died," Zoe says. "This show will be beyond the beyond." This is a guaranteed train wreck that you don't want to miss. Click here for more on the story.